Sample Disability Certificate Format is available for free download in ms word and ms excel. This sample disability certificate template normally used to get govt benefits for disabled children or persons and to get jobs in govt sector or in multinational companies. Certificate of disability include type of disability and cause of disability as evidence with recommendations to perform jobs or any special tasks where the disability doesn’t matter or disturb the performance of disable person. This certificate can be issued by govt departments on simple letter head or printed certificate format. 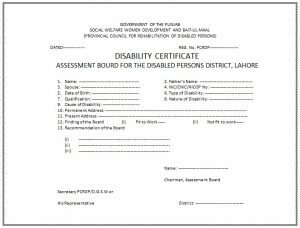 Doctors and Hospitals can also use this per forma to issue disability certificates or can recommend the person to get disability certificate with this per forma. Is a unilateral blind person(a person blind from one eye) falls in disable catogrey? very good. keep it up. but its very dificult to get distabled certificate. it should be ez. I injured in bomb blast in gamy shah blast 2010.i lost my left eye.my both legs were badly injured.. Major surgery of my Stomach.. Now i am alright.. But my both legss have many iron and stone pieces .dats y i cant work hard work.. Can i get disable certificate..